Fourslide forming, also known as multislide or vertislide forming, is a process that uses metalworking machine tools for manufacturing of small metal components. Acme Monaco, headquartered in New Britain, CT, offers this process for manufacturing of small medical device components such as surgical staples, flat springs, etc. In a discussion with Medical Device Summit.com, Lucas Karabin, ‎Executive Vice President; Robert Seeds, Fourslide Tool & Die Maker, and Richard Selander, Foreman, Tool Design, talk more about the process, the advantages it offers to medical device component manufacturers and why it’s ideal for certain types of manufacturing. We present below excerpts from the discussion. MedicalDeviceSummit.com (MDS): What is fourslide metal stamping and what are the advantages? There are various forms of metal stamping. 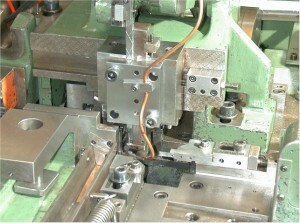 Some of the most common methods are fourslide and press stamping. Fourslide is an efficient manufacturing process and fourslide machines handle many different operations in one machine and provide an integrated set of manufacturing processes. The flat strip can be stamped, coined, or preformed then fed progressively into an area where the strip is held, clipped and formed into its final shape. Welding, tapping and assembly may also be added into this process. With the fourslide technology, any type of metal, whether it be stainless steel, carbon steel, or titanium, can be made into specific shapes. There is more adjustability in the fourslide method – it is easier to make adjustments to measurements in a fourslide allowing more flexibility. 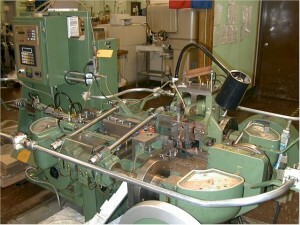 In press stamping, a die set is mounted in the machine as one unit. With fourslide, you have a lot more adjustability for design changes. MDS: Why make some parts on a fourslide and others on a press? When a device involves the use of complex parts and we are talking about numbers such as 50,000 or 100,000 parts, it is not cost-efficient to make these on a press; it’s more cost-efficient to use the press method for making millions of parts. While this method is more expensive, over large volumes you can realize the investment. The fourslide process is very commonly used by companies that need metal components such as surgical staples or flat springs in staple guns, etc. as well as commercial products such as clips, connectors, and various other metal formed parts. The Fourslide process is ideal for making products with a lot of bends in it; this can’t be easily achieved in a press tool. MDS: What is the expected lifespan of a fourslide tool? The lifespan of a fourslide tool is very good. If you have a problem with one part of the tool, it’s very easy to remove it, fix it, and replace it. If the tool is well maintained, it can last as long as your project is going to last. MDS: Is fourslide tooling expensive? How do companies pay for it? And are there many Medical ISO 13485 certified fourslide manufacturers? It’s easier to make samples with fourslide and a lot less expensive than a press tool. Companies pay for the manufacturing of the tool. The tools are designed in-house from input provided by the customer. If the need is for a million units, the cost of the tool can be realized over the course of its use. Fourslide has been around for over a 100 years. Today, the time it takes to develop and build the tooling is faster due to innovations such as wire EDM and CAD. For instance, if a die had broken earlier, it would have taken a week or more to fix it. These days, we can have it up and running within hours. While it is pretty expensive to maintain a Medical 13485 certification, the number of such certified fourslide manufacturers is growing. Acme Monaco is highly diversified in the medial industry, so it makes sense to have our 13485 certification for 11 years now. For more information visit Acme Monaco.